The group of scientists that make up the Intergovernmental Panel on Climate Change found in 2007 that the warming of Earth’s climate is unequivocal and largely due to human activity. Earth’s climate has changed in the past, though the recent magnitude and pace of changes are unprecedented in human existence. Recent decades have been warmer than at any time in roughly 120,000 years. Most of this warming can be attributed to anthropogenic activity, primarily burning fossil fuels (coal, oil and natural gas) for energy. Burning fossil fuels releases carbon dioxide and other heat trapping gases, also known as greenhouse gases, into the atmosphere. This warming cannot be explained by natural causes (volcanic and solar) alone. It can be said with confidence that human activities are primarily responsible for the observed 1.5 °F increase in 20th century temperatures in the Pacific Northwest. A warmer climate will affect this state substantially. In 2007, the Oregon State Legislature charged the Oregon Climate Change Research Institute, via HB 3543, with assessing the state of climate change science including biological, physical and social science as it relates to Oregon and the likely effects of climate change on the state. 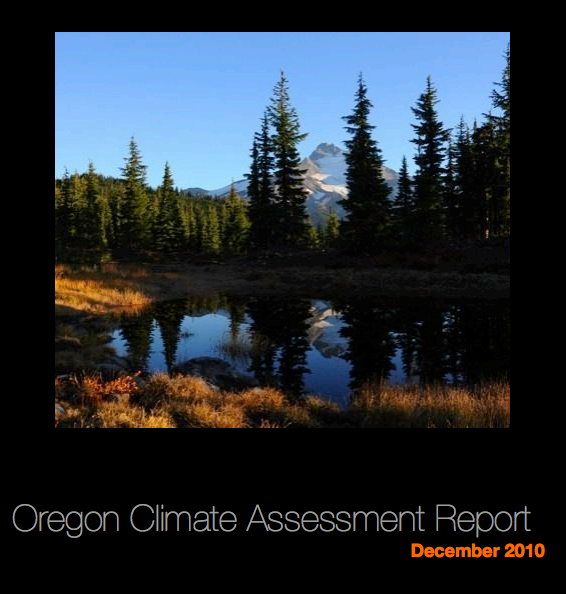 This inaugural assessment report is meant to act as a compendium of the relevant research on climate change and its impacts on the state of Oregon. This report draws on a large body of work on climate change impacts in the western US from the Climate Impacts Group at the University of Washington and the California Climate Action Team. In this report, we also identify knowledge gaps, where we acknowledge the need for more research in certain areas. We hope this report will serve as a useful resource for decision-makers, stakeholders, researchers and all Oregonians. The following chapters address key sectors that fall within the biological, physical and social sciences in the state of Oregon.